This past weekend, for the feast of the Apostle Andrew, founder of the Church of Constantinople, Pope Francis of Rome made a historic visit to the Phanar as a sign of mutual love and cooperation in ecumenical dialogue. It was widely covered by the media, while Pope and Patriarch made mutual statements, mutual prayers and mutually signed documents. They even shared a mutual embrace. 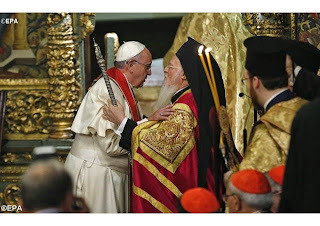 It is easy for the pious and simple Orthodox faithful to be scandalized by such actions, but we must remember that the Pope and the Patriarch still have mutually exclusive goals that prevent their relationship from ever consummating. That is, their terms of union are mutually exclusive. This Convent was founded during the Byzantine era. 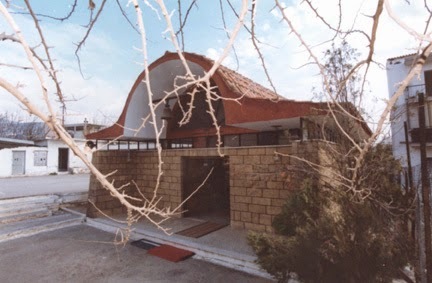 Since 1264, in the proceedings of the Latin Diocese of Kefallonia, it is referred to as a Monastery. 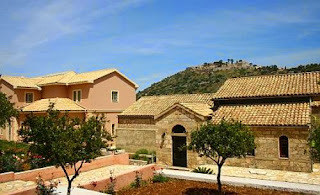 In the following centuries the Monastery was deserted and it was reestablished in 1579, when three spiritual sisters Benedictine, Leondia and Magdalene, originating from the first capital of Kefallonia - the Middle Age Municipality of Kastro - bought the land where the ruined chapel of the Apostle Andrew preexisted, aiming to lead a monastic life. 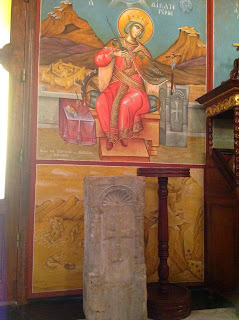 Soon after it became a Convent and in 1639 the Greek Romanian Princess Roxane, renamed nun Romilia, daughter of the Protospathario leader of Moldovlachia Zotos Tsigaras and grandaughter of the sovereign of Moldovlachia Peter Voevodas, started her monastic life. 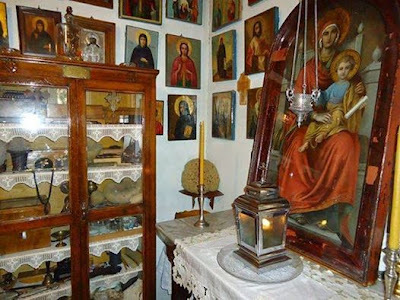 In the village of Chiliodendro of the Holy Metropolis of Kastoria within the solemn atmosphere of Vespers, there took place the translation of the relics of an unknown martyr, the Priest Vasilios Karapalikis, who in 1902 was martyred by Muslims with a bullet and an axe to the head. He was a pious man, respected even by the Turks. However, envy for his holy life in general, initiated the fury of the conquerors. 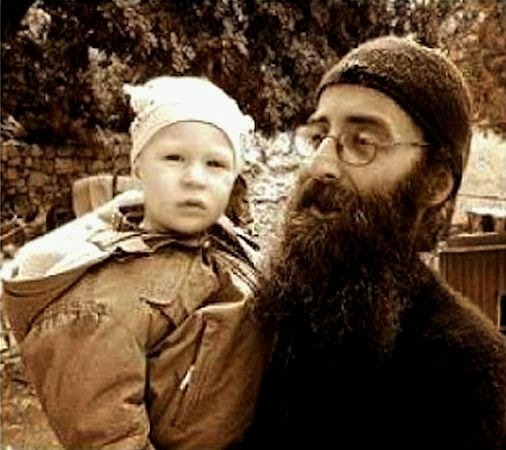 In the 112 years that have passed since then and with the continuous miraculous interventions, appearances and protection to persons of his village and his family, he has been established as a martyr of the Church. "During the German occupation we suffered a lot. 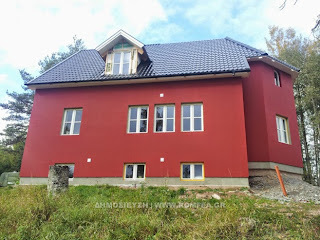 The day arrived when there was nothing in the house except water! Then my father took us by the hand and we climbed up the mountain, which towered above our village, and we gathered lupins. My poor mother boiled them a thousand times over, but the bitterness did not lessen. With these we fooled our hunger, but our eyes burned from the bitterness. And one could only imagine that my oldest sister was seriously ill. But what would my brothers eat who were working and still developing? 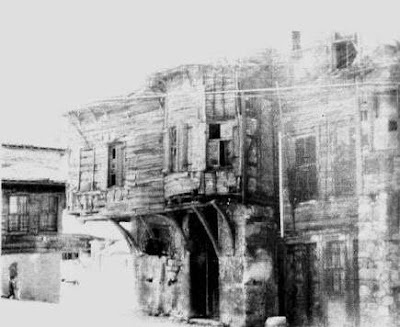 Before the Holocaust, Thessaloniki was home to 80,000 Jews. In 1943 under Nazi occupation some 60,000 Jews were deported to Treblinka and Auschwitz, approximately 90% of whom were murdered. 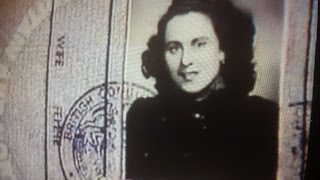 A number of Thessaloniki Jews were involved in resistance acts both in the Warsaw uprising and the October 1944 attack and bombing in Auschwitz. 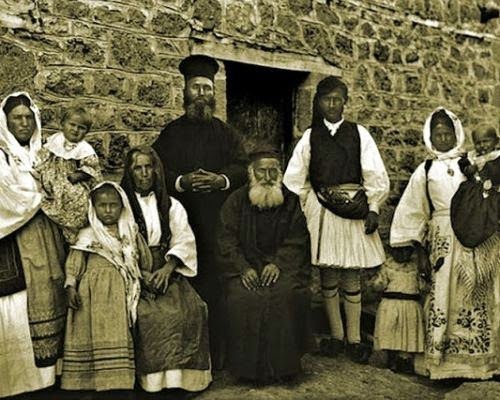 Over 300 Greek Gentiles have been recognized by Yad Vashem as Righteous Among The Nations for risking and giving their lives to help the Jewish people during this time. Following the recent completion of the restoration of the 14th century Church of Saints Alypios and Stylianos in Tsouka of Kastoria by the 16th Ephorate of Byzantine and Post-Byzantine Antiquities in Kastoria, Metropolitan Seraphim of Kastoria performed the Ceremony of the Opening of the Doors, followed by a Hierarchical Divine Liturgy on November 26, 2014, which is the feast of the two Saints who were both from Paphlagonia. The following miracle is published on the official website of the Ecclesiastical School of Lamia, whose patron saints are Saint Katherine and Saint Stylianos. 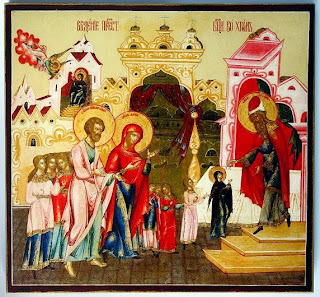 On the 8th of the month of April on a Wednesday between 9:00PM and 9:15PM, at the time when the Ninth Ode of the Great Canon was being chanted, the icon of Saint Katherine began to move at a very slow pace, right and left. At that time all of us children were in the church, at the chanter's stand and in the seats, the sanctuary and other places. Five chapels in Kythera are dedicated to Saint Katherine, who is a much loved Saint throughout Greece and is celebrated on November 25th. 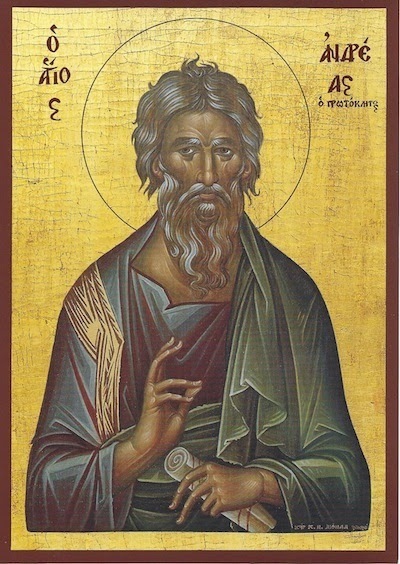 The Monastery of Saint Savvas the Sanctified in Alexandria and specifically the central church, before it became a Christian house of prayer, was dedicated to the god Mithra or, according to other witness, to the god Apollo. 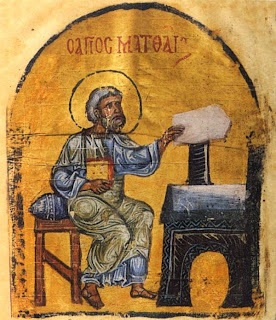 It was established as a Christian church, dedicated to the Apostle and Evangelist Mark around 318-320, when 40 Christian churches were established in Egypt by Imperial permission of Constantine the Great. During the next few years cells began being built and the settlement of monks around the church began too. Following the break away of the copts from the Alexandrian Church and the creation of the Coptic Church, the Monastery became the Seat of the Orthodox Patriarch of Alexandria (circa 536). 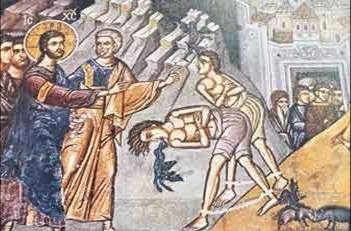 Around the mid 7th century, the Monastery was destroyed by an earthquake and was rebuilt by sponsorship from a wealthy Alexandrian Christian named Savvas in honor of St Savva, because the saint lived in Alexandria before he requested the quiet of the monastery he established in Jerusalem. 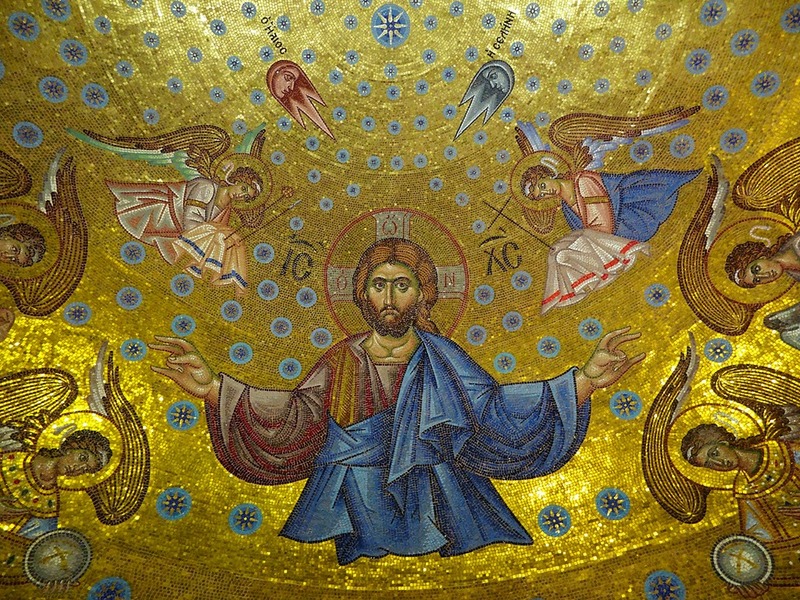 As we approach the beginning of the third Millenium of the Christian era, we would do well to orientate ourselves meditatively, spiritually, to that sacred place, where many centuries before the Incarnation of the Second Person of God the Holy Trinity, He Who is above and beyond time and space and all created things, He Who is ever God and everywhere present, the Creator and the Icon of the Invisible Father (Col. 1:15), made His appearance to His prophet Moses, in the form of a burning bush, burning but not consumed by fire (Exodus 3:2-6). This was the historic moment, when the Mountain of Sinai was consecrated to the unceasing worship of the Living God, the "God of Abraham, Isaac and Jacob", the God of our fathers. 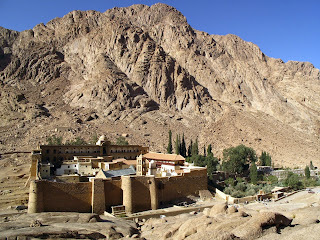 This was also the beginning of a meta-historic experience, whereby man approached God, so as to know himself better, and ascending in stages, reached the summit of perfection, of which the craggy peak of Sinai was, and is, such an eminent and inspiring symbol. But, theologically also, the appearance of the Incomprehensible Divinity in a bush, burning but not consumed, was an important symbol of the visit from on high of the pre-eternal Son of God, born of a Virgin, whose womb remained intact as before. Sinai's mystical consecration as the Mountain on which God walked and talked with his chosen servants, is contrasted with an episode of a very different kind, also in the Book of Exodus. Many analysts of global jihadism, as it is manifested today, and scientists are engaged in the question as to why the young people who were born and raised in the West choose to become jihadists and go to Syria and Iraq and fight the war of the Islamic Movement. The question is: "How can you stem the flow of foreign jihadis making their way to Syria and Iraq?" 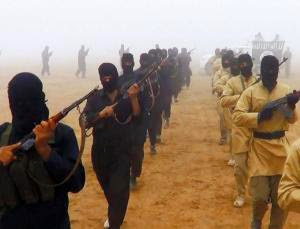 New Scientist hosts an article by Michael Bond that analyzes this issue ("Why Westerners are Driven to Join the Jihadist Fight", 10 September 2014). Finally in this country, in this place which for centuries has been watered and nourished with the spouts of blood of the martyrs and saints of our Faith and Nation, it seems that some people have set about, authoritatively, to undertake the role of "catastrophizer", by desacrilizing and dechristianizing our people. 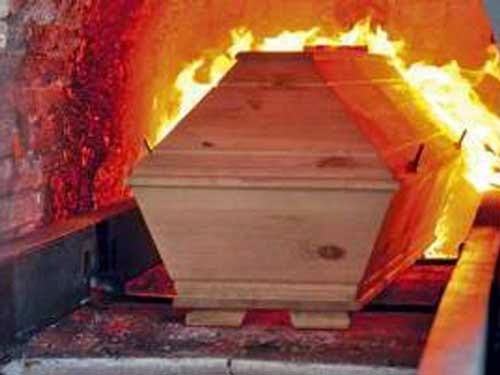 Behold, therefore, what they thought of and legislated regarding cremation. Churches resemble ports in the ocean, which God has placed in cities — spiritual ports, wherein whoever of us takes refuge finds indescribable calmness of soul, made dizzy from worldly business. And precisely as a calm and waveless port offers safety to the boats docked there, so also the Church saves from the storm of earthly cares whoever hastens to it, and grants the believers to stand securely and listen to the word of God with great calmness. The Church is the foundation of virtue and the school of spiritual life. Just cross its threshold at any time, and immediately you forget daily cares. Pass inside, and a spiritual ray will surround your soul. This stillness causes awe and teaches the Christian life. It raises up your train of thought and doesn’t allow you to remember present things. It transports you from earth to Heaven. And if the gain is so great when a worship service is not even taking place, just think, when the Liturgy is performed — and the prophets teach, the Apostles preach the Gospel, Christ is among the believers, God the Father accepts the performed sacrifice, and the Holy Spirit grants His own rejoicing — what great benefit floods those who have attended church as they leave the church. The joy of anyone who rejoices is preserved in the Church. The gladness of the embittered, the rejoicing of the saddened, the refreshment of the tortured, the comfort of the tired, all are found in the Church. Because Christ says, “Come to me, all who are tired and heavy laden, and I will give you rest” (Matt. 11:28). What is more longed for than [to hear] this Voice? What sweeter than this invitation? The Lord is calling you to a Banquet when He invites you to church. He urges you to be comforted from toils and He transports you to a place of comfort from pain, because He lightens you from the burden of sins. He heals distress with spiritual enjoyment, and sadness with joy. 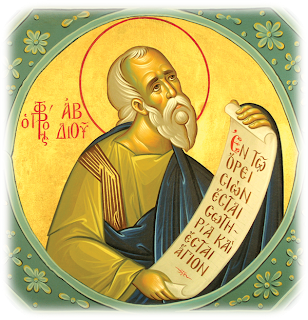 Do not be scandalized when you hear what is said against the Faith, since they who say those things do not understand its essence... You should always remember the basic principle that the early Christians knew very well. They considered unfortunate the man who knew all the sciences, but did not know God. Conversely they considered the one who knew God to be blessed, even if they completely lacked human knowledge. With the blessing of my much-beloved Elder Gregory, abbot of the Sacred Monastery of Docheiariou at Mount Athos, for the last eight months I have been making two Archangels for the Monastery. On Sunday 16 November 2014 a ceremony took place in the Cathedral of Saint George in Stockholm transferring the Hesychasterion* of Saint Nicholas in Rattvik to the Holy Metropolis of Sweden and all Scandinavia. 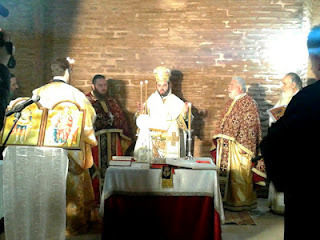 In his homily, His Eminence Metropolitan Cleopas of Sweden said: "Our earnest desire and goal was to establish a monastery to attract both Christians and non to a spiritual center of prayer, asceticism and spiritual reflection for our Orthodox brethren in the five countries that make up the Metropolis of Sweden. 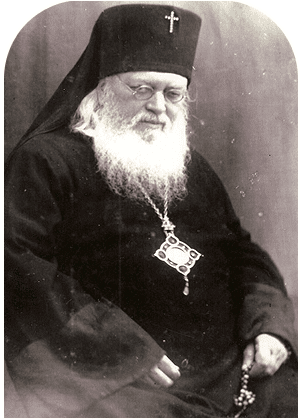 The soul of the blessed founder of the Hesychasterion, Archimandrite Eusebios Vittis, must be rejoicing and resting after the memorial service we conducted for him today. The transfer of the Hesychasterion to the Holy Metropolis was his innermost desire." 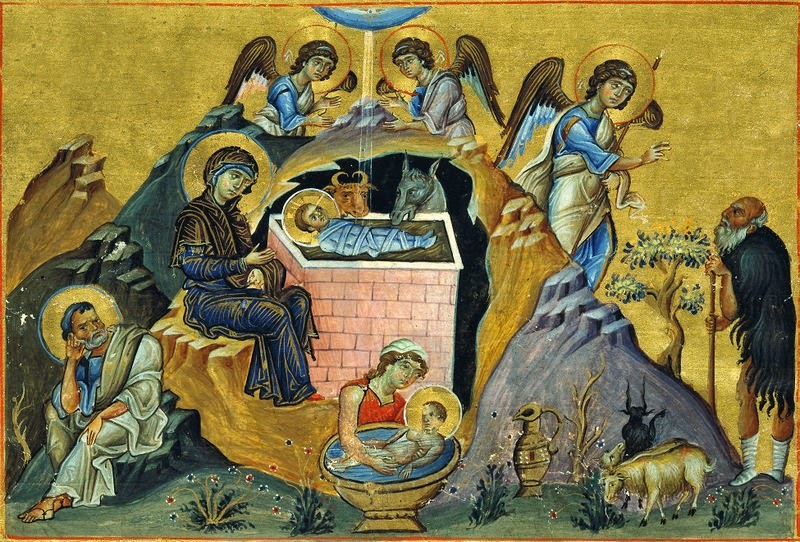 Entering the blessed period of the holy forty days of Christmas we are revived by the fast, and we are revived by the feast that has arisen and are gladdened by the protagonist of the celebration. We are revived by the fast through the rich dishes that come with it, especially by the fish. We are revived by the celebration of the Entrance of the Mother of God that has arisen, and through the festival of the celebration schedules are compiled, and work is organized and conducted, in order to adorn the holiday. 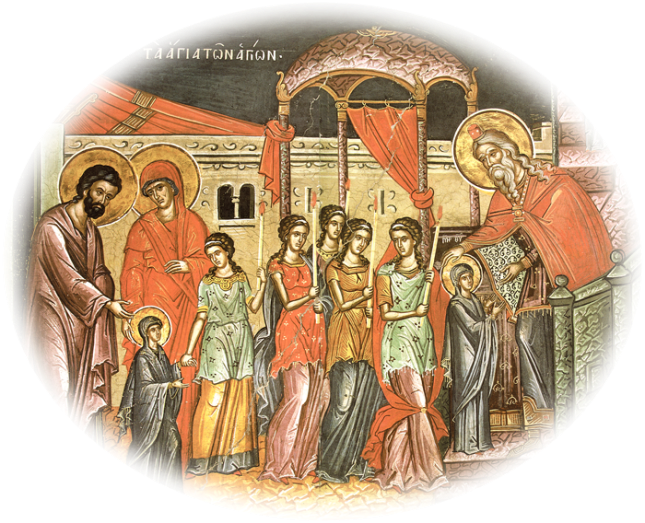 Apart from the above, the greatest, most primary, most joy creating, and especially most graceful, is the protagonist of the festival, the heart of our sweet love, the Most Holy Theotokos. 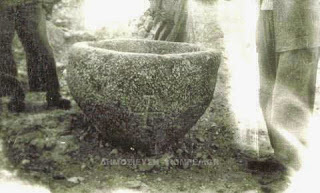 Many religious traditions, as pointed out by George Megas, are rural, with ancient roots in the expectation of a good harvest. Because even the weather conditions throughout Greece are not the same, the beginning of agricultural work, especially the seeding, does not take place at the same time, and so basically the same custom takes place on different days shortly between each other. to be raised in the Lord. At the start of the Christmas fast, when the forty days of Advent begin, we are presented with the feast of the Entrance of the Theotokos which foreshadows the event of the coming of the Lord and the Divine Economy. It is an event that does not appear in Holy Scripture, but the Church derives its information from the so-called apocryphal Gospels. It is one of the few exceptions it does this. 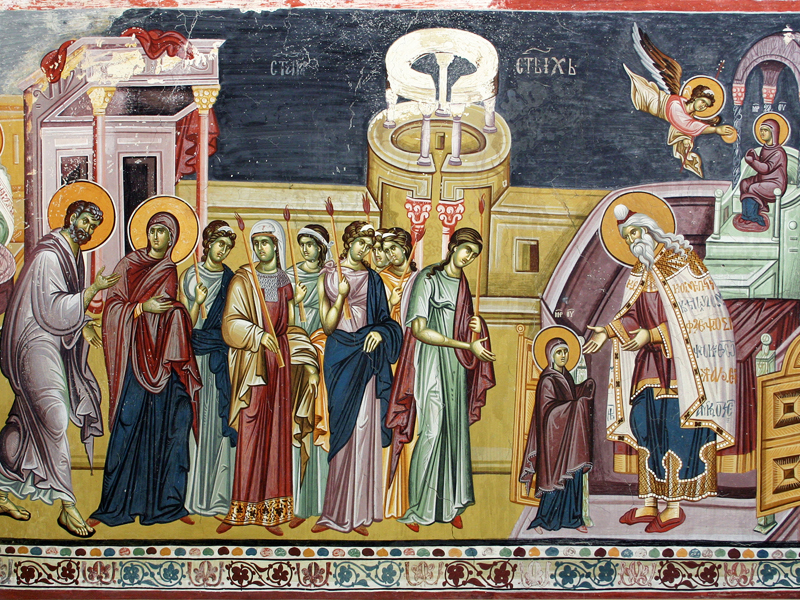 The Theotokos is presented as being offered to the Temple at the age of three. 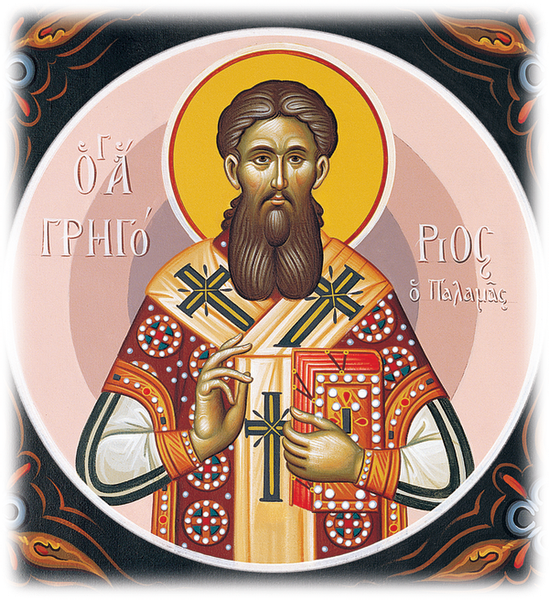 What does such an event have to say to us and why is it so important in the mind of the Fathers, who in their writings offer their own words about it as food for the faithful and the Church? Is it a simple little story or is it a theological event that has a particular importance for each of us? the Theotokos into the Temple. And shortly he shall come and shall say to you: Rejoice. On the twenty-first Mary entered the sacred temenos. The venerable Elder Iakovos Tsalikes, the admirable Abbot of the Monastery of the Venerable David in Evia, was a long-range star who shined in our days with the rays of his simplicity, his goodness, his equal-to-the-angels state and his numerous wonders. 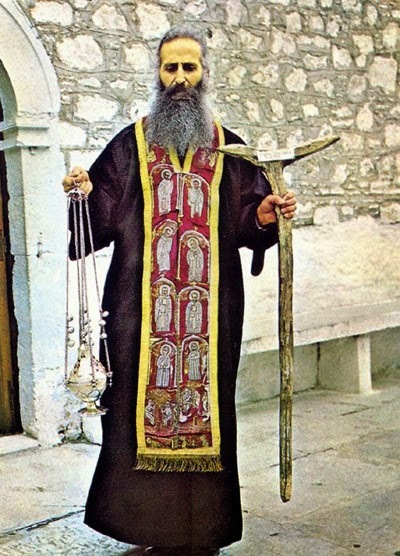 Elder Iakavos was the personification of love, a living embodiment of "the new life in Christ", a projector of virtue and a mirror of humility and temperance. It is the sought after type of being, even within the Church. It is what should distinguish the faithul and especially those clergy devoted to the ministry of the Church, yet it is so distorted and abused, that it is used as a promotional image for the creation of impressions and to achieve goals. The ethos of the Church is the ethos and character of Christ. It is the ethos of the saints. 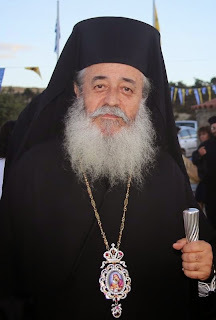 I had the joy to meet the perennial and virtuous hesychast Abimelech and to receive his prayers and admonitions. He was a beloved bosom friend of Saint Nektarios, the Metropolitan of Pentapolis, and maintained correspondence with him, while he himself was invited to visit Aegina to come and give admonitions to the nuns of the Monastery that Saint Nektarios established there. He responded with hesitation and humility: "You the enlightened and knowledgeable teacher and hierarch urge me the miscreant to urge and admonish the nuns?" 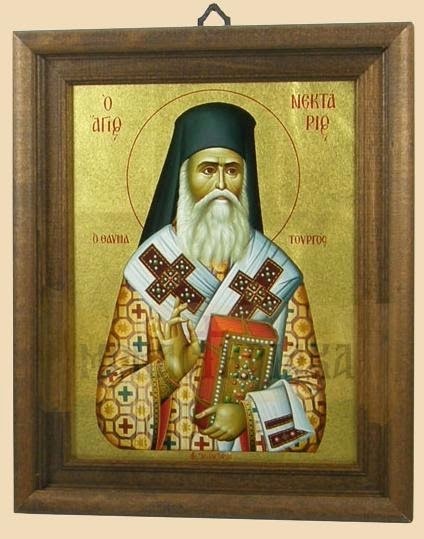 Saint Nektarios responded with equal humility: "I speak and teach based on studies and theories, while you have Athonite experience and praxis." The Prophet Obadiah or Abdia, whose name means "servant of the Lord", came from Shechem and lived in the second half of the 6th century B.C. 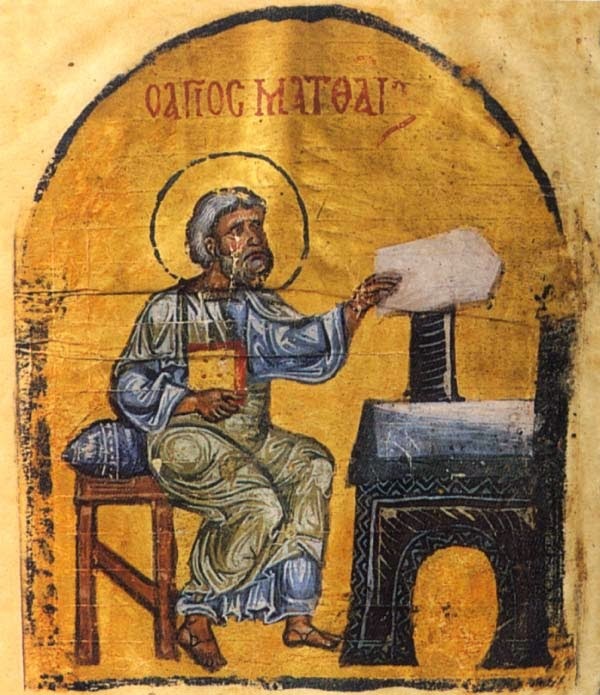 He is one of the Twelve Minor Prophets, whose book is the smallest in the Old Testament containing only 21 verses. In September of some year in the oncology department of the University Hospital of Rio, there was a great disruption. Little Demetri was urgently asking for the priest of the hospital. He wanted to surely receive Communion. He was 13 years old. For about a year and a half he was in this clinic. A small headache led him there. The doctors diagnosed him with brain cancer. His origins were from Fier in Albania. The parents were not baptized. For many years they were living in Patras. Shortly before entering the hospital, he wanted to be baptized. He would hear about Christ and wanted to be His "child". He was baptized "in the name of the Father and of the Son and of the Holy Spirit", after catechism of course. 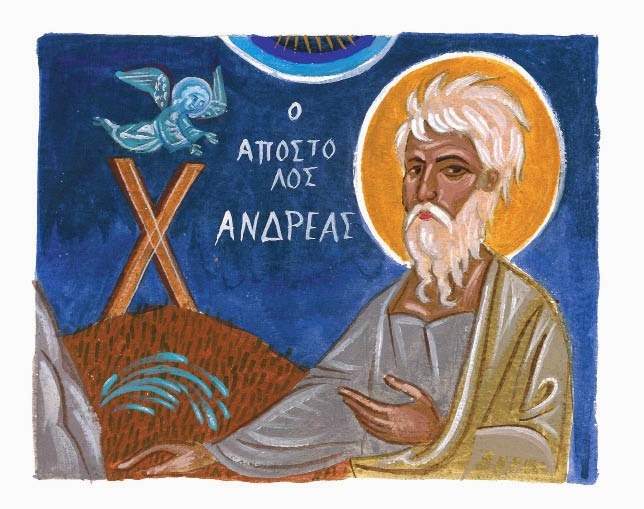 Once, when I was a young presbyter, it happened that while I was serving in certain villages outside of Thessaloniki, at the same time I was helping a very great theologian at the theological school. What I experienced there, at the same time as I was writing my doctoral thesis at the theological school, was a terrible contrast. On the one hand, at the theological school I had contact with the great and paradoxical and obscure and deep matters of theology, and on the other hand I was a priest of ten villages to which I was assigned by my bishop then, with three or four villages in which I would go and preach. This is what I did then. I felt terrible loneliness, because no one understood me, or I thought they didn't understand me. Where is the value in our contemporary Elders, such as Fr. Sophrony, Fr. Porphyrios, Fr. Paisios and others? These are people who prove that Christianity is the truth and that it can be experienced. 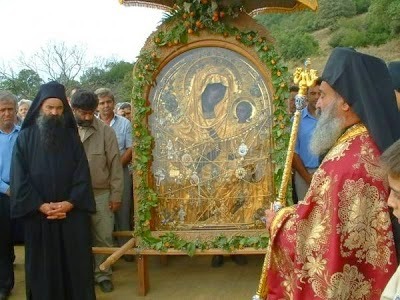 After many years, at the birthplace of St. Nektarios in Selybria, where he lived until he was 14 years old and then left for studies in Constantinople, the feast of this newly-appeared Wonderworker Nektarios Kephalas of Aegina was celebrated on November 9, 2014 by Metropolitan Maximos of Selybria and Exarch of Europe, at the Byzantine aqueduct (Kilise Sarnici) beneath the ruins of the historic Byzantine Church of St. John the Theologian, now the Fatih Camii, built by Grand Duke Alexios Apokaukos. One of the most precious spiritual treasures of Orthodoxy, a fragment of the honorable skull of the Apostle and Evangelist Matthew, whom our Church commemorates on November 16th, is kept by the Patriarchate of Alexandria in its second headquarters in Cairo. It was displayed in 2012 for the first time in recent memory, and each year since then on the feast of the Holy Apostle. The Feast of the Nativity in the Flesh of our Lord Jesus Christ, or Christmas, is one of the biggest days of Christendom. 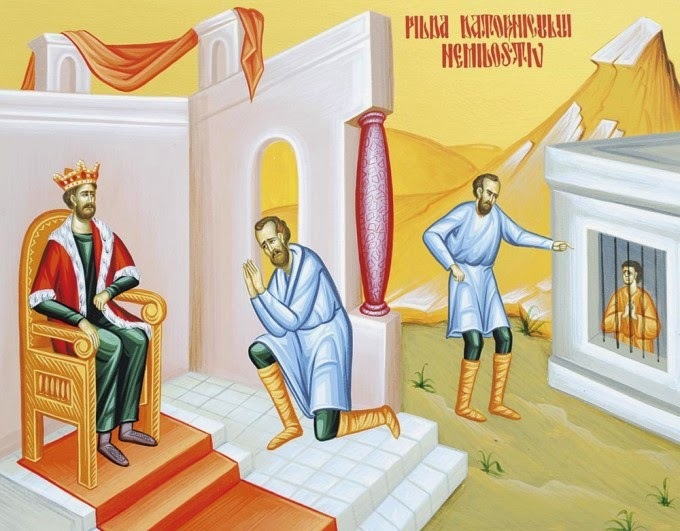 It is among the Despotic Feasts, which relate to the events in the life of Christ the Despot. 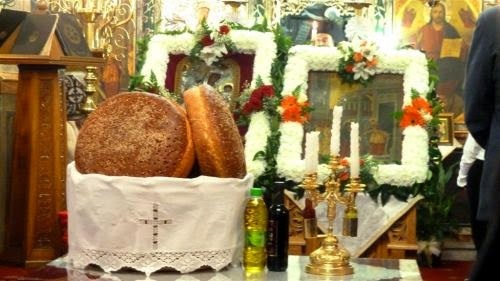 Along with Pascha it is the biggest celebration in the Orthodox Church. 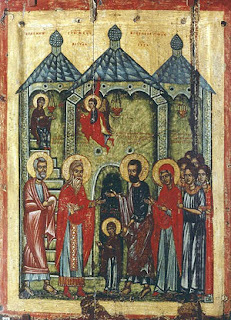 On this day we celebrate the Incarnation of God the Word, when the Second Person of the Holy Trinity descended into the world. God became man that man may become a god by grace. 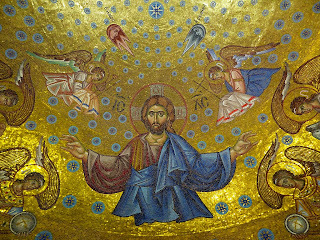 Christ comes down from heaven to earth, to raise man from earth to heaven. Christ came among us to save the human race, to rebuild once again the ruined bridge of our communication with God, to restore man to his true glory, to reveal to us the will of God. Christ deeply humbled Himself to elevate us, He was born in time so we could overcome time, and He took human nature in order to deify it. This is why we feast, rejoice and celebrate. "For Yours Is The Kingdom And The Power And The Glory Unto The Ages. Amen." The Lord's Prayer, known as the "Our Father", which we have now interpreted every Sunday for the past two months this summer, begins with the salutation of God as Father, it continues with seven requests made to God, and it ends with the firm faith in God as King and in His power. "For Yours is the Kingdom and the Power and the Glory unto the ages. Amen." This means that to Him belongs the Kingdom, the Power and the Glory forever. "Our Faith Is Not Sold"
How Did St. John Chrysostom Understand the "Wrath of God" and "Divine Punishment"? 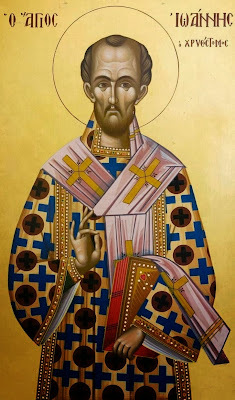 St. John Chrysostom probably more than any other Father of the Church speaks about the "wrath of God" and "divine punishment". Most who read these passages often do so through the lenses of western medieval or reformation theology, even many Orthodox Christians, who are unable to read the depths of the spirit behind the letter. 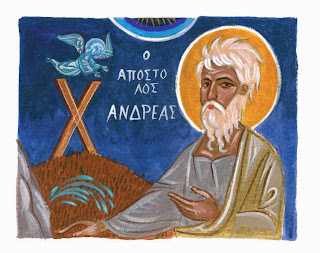 The reason for this is because, as St. Symeon the New Theologian explains, when speaking about matters of divine judgement, "the interpretation is difficult because it is not about things which are present and visible, but about future and invisible matters. There is therefore great need of prayer, of much ascetic effort, of much purity of the nous, both in us who speak and in those who listen, in order for the first to be able to know and speak well and for the others to listen with understanding to what is said." Therefore, those of a carnal, simplistic and overly literal understanding of these passages fail to understand the depth of divine judgement, inflicting upon the nature of God human-like passions, which is exactly what the ancient pagans did with their gods in order to make the impassioned state not only a natural state, but to deify it as well. 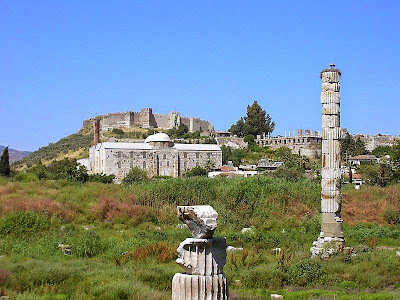 Did Christians Destroy the Temple of Artemis in Ephesus? This pillar marks what remains of the Temple of Artemis. 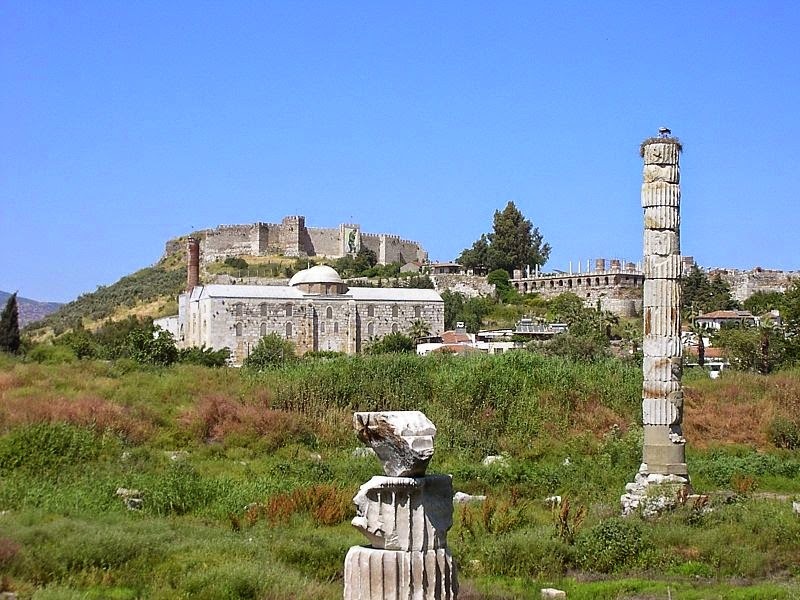 The Temple of Artemis at Ephesus was one of the Seven Wonders of the Ancient World but almost nothing is left of it today. So, the question of who destroyed it is an interesting one. Luckily, we have an explicit historical source that tells us the answer. It is in Jordanes’ History of the Goths composed around 550AD. He tells us (20:107), that in about 259AD, “Respa, Veduc and Thuruar, leaders of the Goths, took ship and sailed across the strait of the Hellespont to Asia. There they laid waste many populous cities and set fire to the renowned temple of Diana at Ephesus, which, as we said before, the Amazons built.” Jordanes’ work comes with a healthy warning because the beginning is pure legend (not to mention his claim that the Amazons built the Temple). However, it is generally felt to be reliable when it deals with encounters between the Goths and Romans from the third century AD. 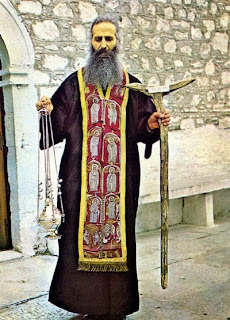 Mr. Panagiotis had gone to Mount Athos and was given hospitality by the fathers of the Sacred Great Monastery of Vatopaidi. On October 26, 2014 he persistently requested of the fathers to go to Confession, and the fathers told him that the next morning, Monday, he could go. 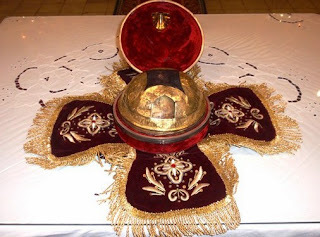 On October 27, 2014 at 4:00am, when Matins had begun, he went down to the church, and having venerated the icons, he took his seat. There were other people in the church, and he went and took a seat in a stall, and there was a man next to him while the following stall after was empty. Demetrios Dimitrakopoulos from Farsala in Thessaly recounts a recent miracle of the Panagia Gorgoepikoos (She Who Is Quick To Hear) as he lived it, to the glory of our Panagia. On September 9, 2014 the Sacred Icon of the Panagia Gorgoepikoos was in the Metochion of the Sacred Monastery of Docheiariou in Soho of Thessaloniki. I was collecting tomatoes in Trikala in the village of Paliopyrgos, and due to much rain there was trouble harvesting the tomatoes. One of the producers with a very good tomato production took me to his field to see and gather. 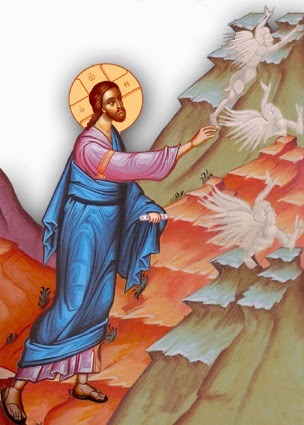 "But Deliver Us From The Evil One"
As we saw in the previous request of the Lord's Prayer, temptations are prompted and caused by the devil, who is characterized here by Christ as evil, and with this request Christ asks us to supplicate God our Father to redeem us from the evil one. And you received prizes O Nicholas. 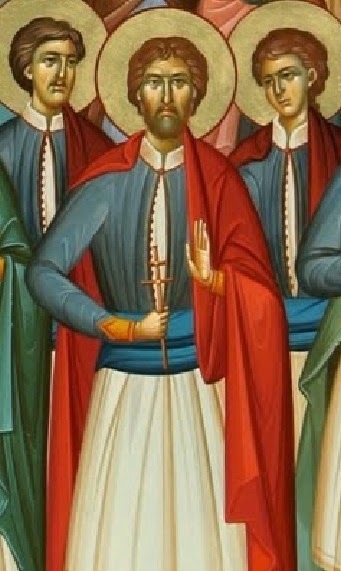 We do not have the details of his life, but this glorious New Martyr of the Christian faith was martyred in Constantinople for his piety in the year 1732 (others say 1742). 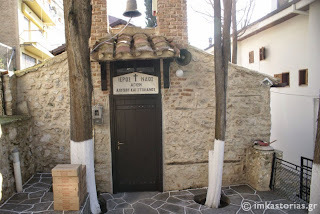 Saint Nektarios was born on October 1, 1846 in this modest house in Selybria of Eastern Thrace. In the bedroom of St. Nektarios, which is still preserved at Holy Trinity Monastery in Aegina, there is a large icon of the Panagia. 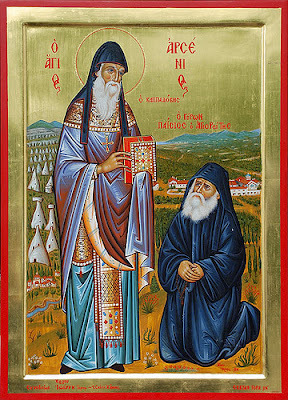 This icon was commissioned by St. Nektarios from an iconographer among the Danielites of Mount Athos. 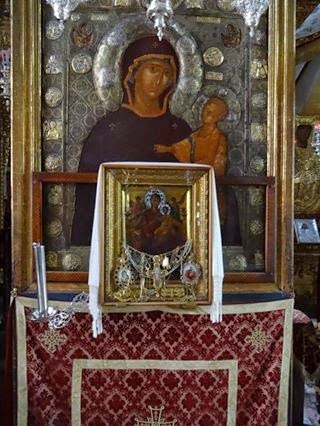 It is an imitation icon of the Panagia from a church in his birthplace of Selybria to which he was spiritually tied from a young age. 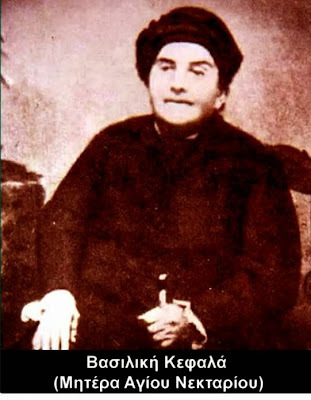 Saint Nektarios was born on October 1, 1846 in Selybria of Eastern Thrace. 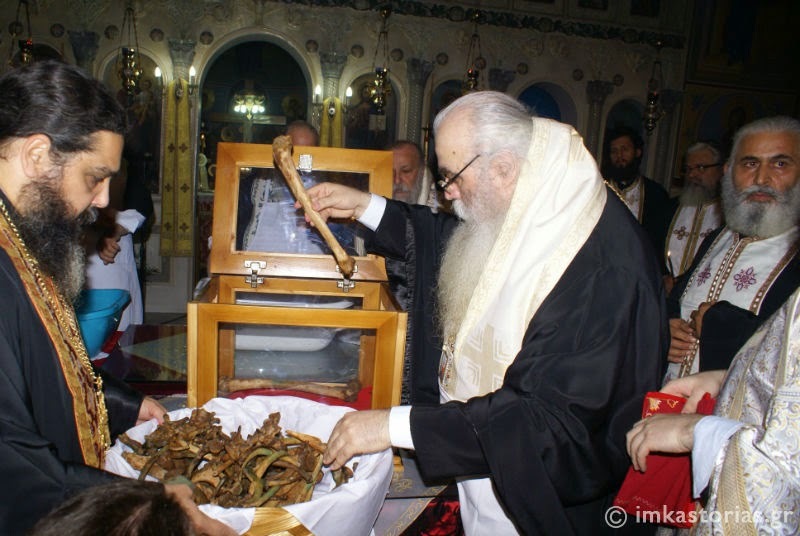 At Holy Baptism he was named Anastasios Kephalas. 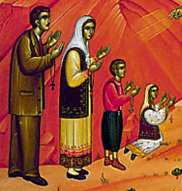 His parents, Demos (Demosthenes) and Balou (popular for Vasiliki) Kephalas, were simple, poor and pious Christians. 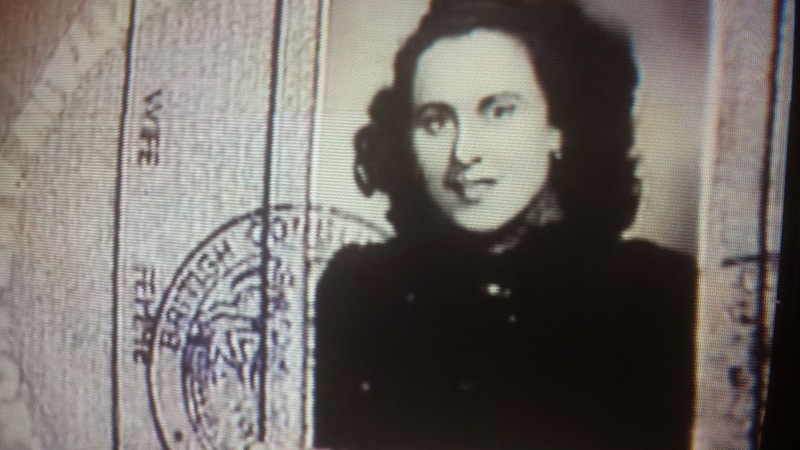 Demos was from Ioannina and Vasiliki, whose maiden name was Triandafyllidou, was from Selybria. Anastasios was the fifth of six children: Demetrios, Gregory, Smaragda, Sevasti, Mariora and Haralambos (his name appears in the will of the Saint, but some sources say he replaced the Saint as teacher in the village of Lithi in Chios). They brought him up in a manner pleasing to God, and did what their very limited means allowed for his formal education. His first letters were taught to him by his mother, which she based on the writings of the Church. Thus, when his mother taught him Psalm 50, he liked to repeat the verse: "I shall teach thy ways unto the wicked and sinners shall be converted unto thee." "And Bring Us Not Into Temptation"
The entire life of man is an ordeal. For this reason Christ taught us to pray to God - "Father, do not allow us to enter into temptations, precisely because we are weak and sick." Besides, all the discomforts that have come into our life are a continuation of that first and great temptation received by the first-formed in Paradise. They succumbed to the temptation, even though they had the Grace of God and were entering into communion with Him. How much more can this happen to us who have a mortal and impassioned body, with all its consequences. 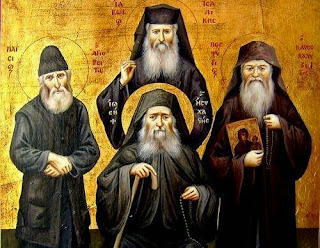 In 1986 the Ecumenical Patriarchate officially recognized the holiness of Saint Arsenios the New and Wonderworker (+ 1924), the godfather of Elder Paisios the Athonite, and established his memory to be celebrated on November 10th, the day of his repose. The disposition of Saint Arsenios the Cappadocian recalls the teachings of the Gospel he applied throughout his life. By the grace of God he showed himself to be a Gospel in the flesh. He evaluated everything, both earthly and heavenly, always having Christ as the measure. Whatever was not pleasing to Christ, he rejected as chaff and an abominable thing. "And Release Us From Our Debts, As We Release Our Debtors"
Every prayer has four elements, namely doxology, thanksgiving, repentance and supplication. We see these also in the Lord's Prayer. With the fifth request of this prayer - "and release us from our debts, as we release our debtors" - we are supplicating God to forgive the sins we have committed as we also forgive those who have sinned against us. Here we can identify two points that Christ shows us with this request. The first is that we must ask forgiveness from God for the sins that we commit and by this we show our repentance, and the second point is that we should be distinguished by not having the remembrance of wrongs committed against us. He thus shows us the way and the preconditions under which we will receive the remission of our sins. 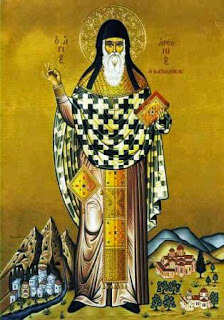 Today, November 10th, our holy Church honors the memory of Saint Arsenios of Cappadocia. Saint Arsenios baptized Elder Paisios as an infant in Farasa, and he ordered his parents to give the child his name and not the name Christos that belonged to his grandfather. He then prophesied the meaning behind this: "It is good that you want to leave someone at the foot of the grandfather, yet do I not want to leave a monk at my feet?"